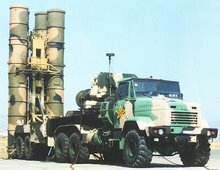 Iran has also been trying to acquire the S-300. Russian officials told Foreign Minister Avigdor Lieberman during his recent visit to Moscow that if Israel wanted to stop the sale it would need to buy the system in place of Iran or find an alternative customer. Defense officials said Israel had no intention in purchasing the system. Israeli defense officials said Egypt's interest in the Russian air defense systems was not directly connected to Israel but could have an impact in the event of a future conflict. "This is Egypt's answer to the Iranians' growing missile capability," one official said. On Tuesday, The Jerusalem Post reported that according to Israeli assessments, the Islamic republic is close to testing one of its domestically developed versions of the North Korean BM-25 missile, which has a range of 3,000 km. Relations between Teheran and Cairo grew uncharacteristically tense in April after reports that a Hizbullah terrorist cell - believed to be operating under orders from Iran - had been uncovered in Egypt, where it was allegedly planning a series of attacks to undermine President Hosni Mubarak's regime.